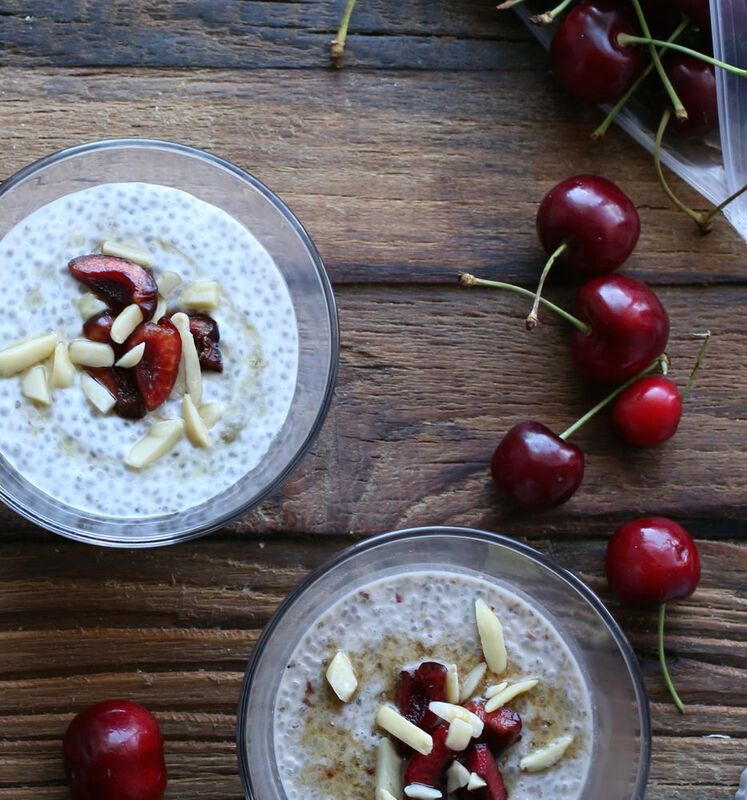 Before cherries are gone for the year, I thought I’d share this quick and very easy recipe for chia seed pudding. When cherries are in season, and I can find good tasting organic ones, there’s really no other fruit I’d prefer to eat. So when I recently found organic cherries at my local supermarket, and they were good, I had to grab a couple of bags. Besides popping them in my mouth and eating them alone, I’ve been adding them to a variety of things—oatmeal, smoothies, salads, and chia pudding. 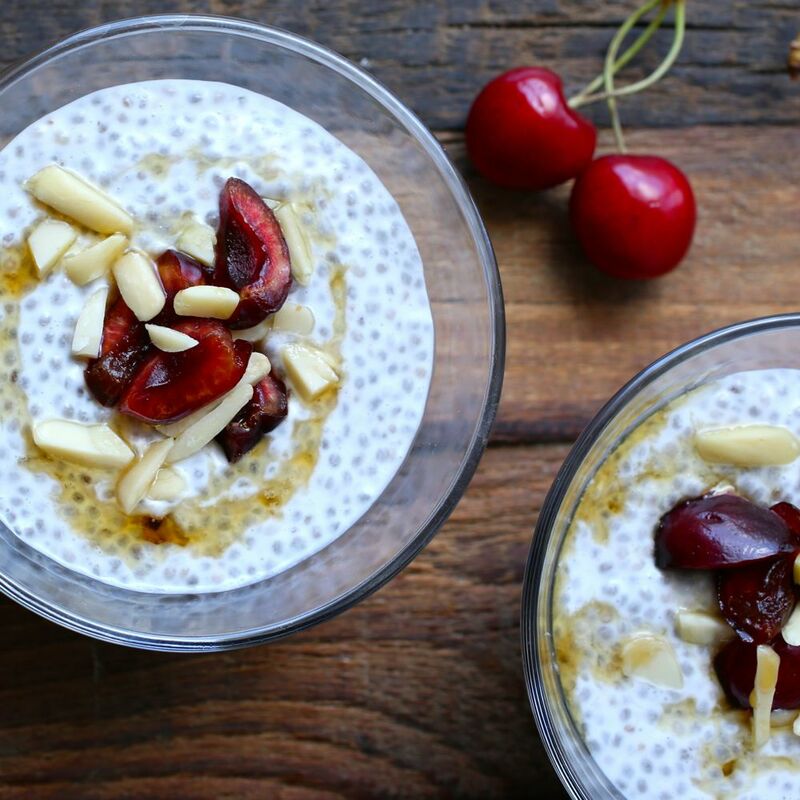 My son LOVES chia pudding, and I give it to him without any added sweeteners (maple syrup or honey), just fruit. 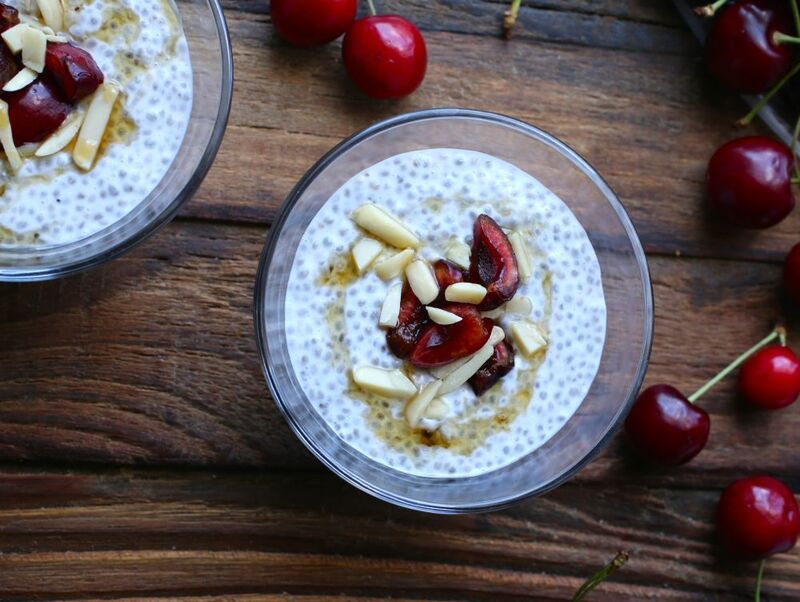 After buying it a few times at local cafe’s and restaurants, I decided it was not only cheaper, but also healthier to make my own chia pudding at home. And, it’s so easy! 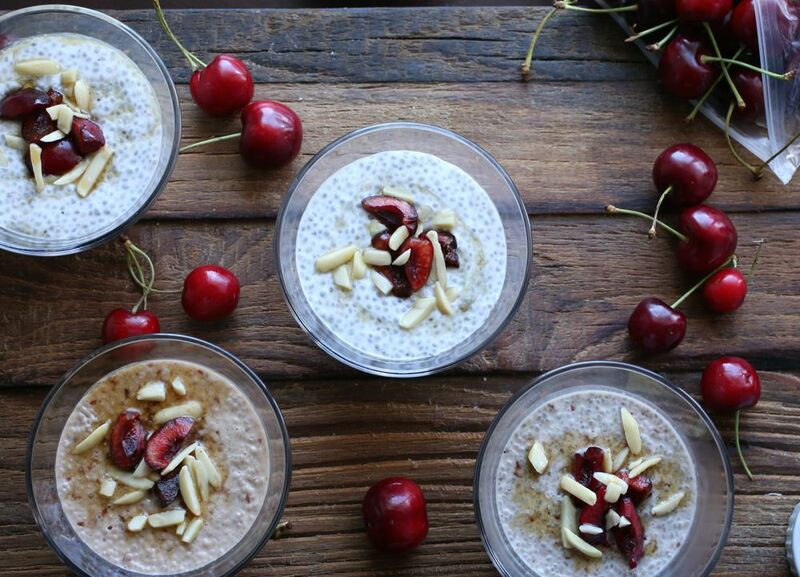 I often make chia pudding plain or with berries, but the past few days I’ve been making it with cherries since they’re only in season for a short time. 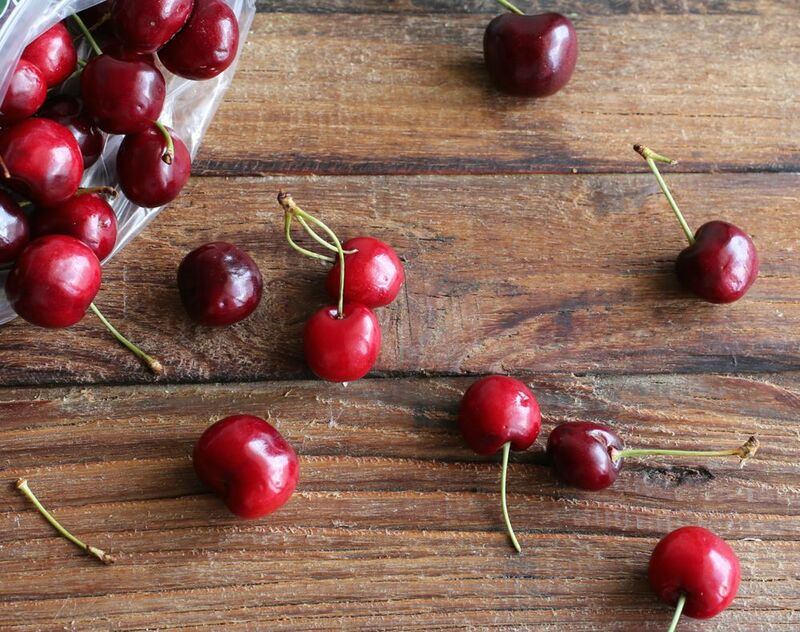 If you can’t find cherries, feel free to substitute with other fruits like raspberries, blueberries, blackberries, bananas, or mangos. All are delicious options. If you can find guavas, feijoas, or passion fruit I imagine those would be good too. This recipe is quite versatile. Here, I’ve used coconut milk, but any other plant milk (like almond, cashew, or hemp) will do. Before adding the chia seeds, you can blend up a few cherries with the coconut milk to make the milk pink (see photo above), if you’d like. Feel free to experiment. You can try other nuts and flavor combinations—blueberries and cardamom, strawberries and vanilla, cinnamon, dates, and so on. As I write this, I’m also thinking about a Mediterranean version with rose water and pistachios that sounds nice…. Next time! As you can see, the possibilities are endless. Have fun with it. You can mix it with oatmeal or have it alone for breakfast, as a snack, or for dessert. In a small bowl combine milk, chia seeds, almond extract, and maple syrup, if using. Stir, then cover and allow to sit in the refrigerator overnight, or for at least an hour or two. Remove from the refrigerator. Your pudding should look thick and the chia seeds gelled. If it’s too thick you can add a little more water or milk. Scoop into serving bowls and top with almonds and cherries and drizzle with maple syrup, if you’d like. Serve immediately. You were faster than me on posting a pudding recipe with cherries 🙂 Looks refreshing! Did you go to the outdoor market, they told me this week is the first harvesting one, and they will be having more next week. You must post your recipe for clafoutis soon; It was delicious! I’ll try to go to the market next weekend, thanks! I have never made anything with chia seeds. I like to give this pudding a try. Looks very delectable! You must try some chia! It doesn’t really have a flavor, but it provides texture and nutritious omegas. We also often add chia seeds to oatmeal and other baked goods. Others drink it, after it gels and plumps up in water or juice. Many, like marathoners, have used it for increased energy. As I mentioned, this recipe is so versatile. Play around with it and flavor as you prefer! I hope you enjoy it!